Most readers of Willa Cather associate her fiction with images of fiery sunsets and endless stretches of wild prairie, with "blond cornfields," and "miles of copper-red grass," as she writes in My Antonia. Although Cather was a native of Virginia, moved to Nebraska as a youngster, and later spent periods of time living in other states and traveling abroad, she lived from 1906 until her death in 1947 in New York City, and in novels and short stories, she cites numerous cityscapes. For example, when the old Nebraskan farmer Rosicky of Cather's "Neighbour Rosicky" thinks back to his youth, he remembers arriving from the old world in lower Manhattan "at Castle Garden," and finding work "in a tailor shop in Vesey Street, down near the Washington Market." One of Rosicky's pastimes then in "the finest, richest, friendliest city in the world" was attending the opera, standing-room only. When Thea Kronborg in The Song of the Lark becomes a diva at the Metropolitan Opera, she lives in an apartment in an uptown hotel on Riverside Drive, and Doctor Archie attends one of her performances seated in the orchestra. Don Hedger in "Coming, Aphrodite," a story saturated with Greenwich Village locales, eats in "a basement oyster house" "behind the Square" where "the floor was covered with sawdust," but Paul in "Paul's Case" dines in the rarified atmosphere of the Waldorf Astoria to the strains of the Blue Danube. 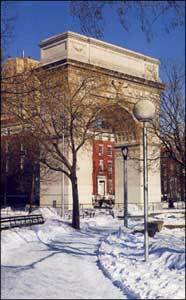 The Arch, Washington Square. Behind the Arch: Fifth Ave. at left, Washington Square North at right. Beginning in 1906 when Cather became an editor of McClure's Magazine and worked with Edith Lewis, a staff proofreader who would become her lifelong companion, Cather lived at four different residences in Greenwich Village. Her first address was at 60 Washington Square South, across the park from the fashionable and elegant residences of Washington Square North. Like one of her own characters in "Coming, Aphrodite!," Cather belonged to that legion of "young people who came to New York to 'write' or to 'paint' – who proposed to live by the sweat of the brow rather than of the hand, and who desired artistic surroundings," but at affordable rents. In 1909, Cather and Lewis rented an apartment at 82 Washington Place, the only remaining residence in its original state. A plaque marks this six-story apartment house commemorating Cather and Richard Wright who lived there in the 1940s. The place that Cather probably considered "home" in New York City and the one that coincided with the most prolific period in her career, was her spacious and comfortable apartment at 5 Bank Street, a five-story brick house, much like others still existing on the block. Now the site of an apartment building where a commemorative plaque appears, Cather lived at the address from 1913 until 1927 when the house was to be demolished. For the next five years, Cather would live at the Grosvenor Hotel at 35 Fifth Avenue, on the corner of Tenth Street facing the Church of the Ascension, which Lewis called "her favourite church in New York; she loved the beautiful altar, with John La Farge's great fresco above." Cather's last New York address was an uptown one: 570 Park Avenue.